More than 40 other states allow daily fantasy betting. But as ads from FanDuel and DraftKings flood TV, Washington residents are banned from playing. For anyone tempted to test Washington’s hard-line stance against fantasy sports, Ronald Ehli has a warning. The former Washington resident knows all too well about how our state rigidly defines and aggressively pursues anything with even a hint of illicit gambling. That’s something the largest fantasy sports companies are well aware of despite being legal almost everywhere else in the country. As debate rages nationwide about whether fantasy sports is gambling or a game of skill, no one from that industry will test a state that tends to seize bank accounts first and ask questions later. Just ask Ehli. In 2008, he owned a Chehalis check-writing service called EZPay when armed special agents from the Washington State Gambling Commission raided his offices while he was abroad. They said a six-month undercover investigation had found Ehli’s company distributed payouts to gambling customers in Washington and elsewhere on behalf of the Sportsbetting.com online wagering site. A warrant was issued for his arrest, and $4.9 million was seized from multiple EZPay bank accounts. Ehli, who was living in semiretirement in Costa Rica, was warned he’d face arrest if he returned to the United States. He claimed it was one of his clients that had ties to the betting company, but he never returned. Ehli later relocated to Nicaragua, where he is married and operates a coconut-export company. Our state’s gambling laws are among the nation’s toughest, and Washington is one of five states — with Montana, Arizona, Louisiana and Iowa — where fantasy sports companies figure it’s too risky to allow local residents to access their sites. 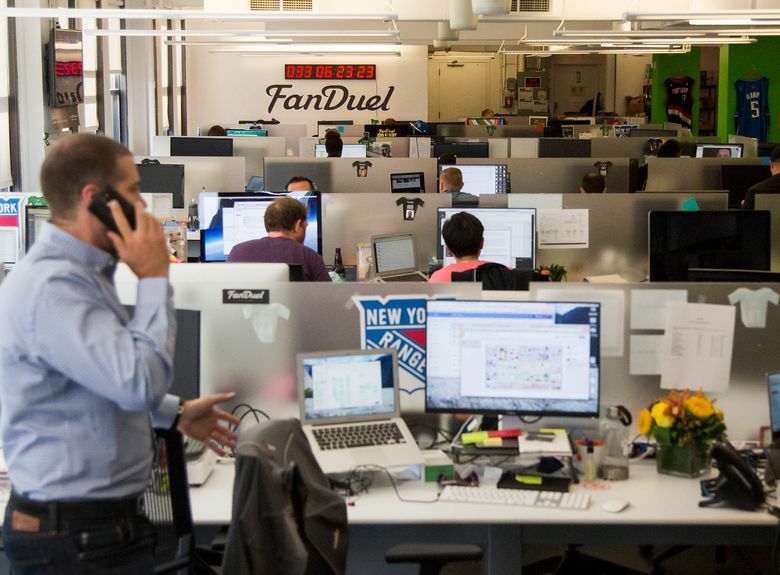 The New York State attorney general on Tuesday ordered Draft­Kings and FanDuel to stop accepting bets in that state. Nevada last month banned unlicensed daily fantasy play. Federal online gaming law exempts fantasy sports, classifying them as games of skill. More than 40 states agree, allowing both traditional and daily fantasy sports to be played. While others bet billions and an onslaught of television ads from fantasy giants FanDuel and DraftKings tout their games, Washington residents are left on the sideline. Two companion bills this year in the state Senate and House of Representatives sought to legalize fantasy sports as games of skill. But that has stalled amid controversy nationwide over how “luck’’ factors into increasingly popular daily fantasy sports. Reports of daily players facing hopelessly long odds and accusations of inside information benefiting fantasy employees has sparked Justice Department and FBI investigations and caused several states to review their laws. Susan Newer, spokeswoman for Washington’s gambling commission, says it plans a presentation on fantasy sports Thursday at its monthly public meeting. Newer says the commission is being “proactive” after recent media coverage of fantasy sports and attempts to soften legislation here. Fantasy sports operators charge entry fees ranging anywhere from 25 cents to $5,000 and allow customers to compete by drafting virtual teams of professional athletes. Points are compiled based on production by those athletes in real games. Traditional fantasy sports last an entire season. But more controversial daily fantasy play awards six- and seven-figure prizes. Industry opponents say luck will factor more than roster-picking skill whenever dealing with highly variable single-game sports performance, making daily fantasy little more than gambling. The investigations and bans come just as the daily fantasy industry has exploded with new cash and changed how Americans view sports — cheering their own “teams” like real ones. The Fantasy Sports Trade Association says there are 56.8 million players in the United States and Canada — up from 12.6 million in 2005. Only 8 million play daily fantasy, but that’s growing exponentially. A late-September report by Eilers Research projected that daily fantasy — which only began in earnest five years ago — will generate $3.7 billion from entry fees this year and grow to $17.7 billion by 2020. Venture capitalists, media companies, professional leagues and team owners have raced to partner with FanDuel and DraftKings. New York-based FanDuel was valued at $1.3 billion and Boston-based DraftKings at $1.2 billion earlier this year before raising $275 million and $300 million, respectively, this summer. 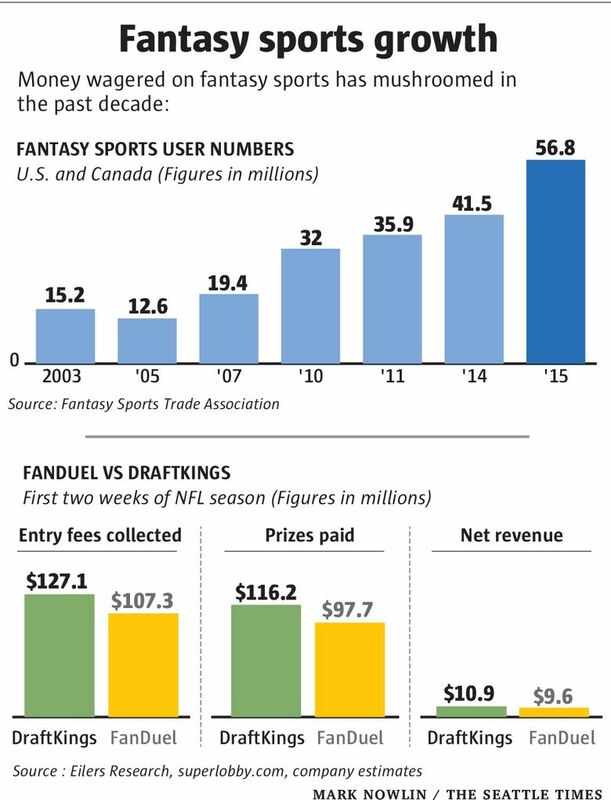 FanDuel, formed in 2009, is the leading daily fantasy operator, but DraftKings, launched in 2012, is closing fast. They occupy a combined 95 percent of the daily fantasy market, and analysts say this NFL season will likely determine the undisputed ruler. As a result, they’ve committed $200 million toward unprecedented advertising blitzes, luring scores of new players who wouldn’t otherwise gamble. Arnie Wexler, a New Jersey-based former gambler and author, who runs a national gambling help hotline, says fantasy sports are a “gateway drug” to serious problems. “When you have that gambler’s gene, fantasy sports are going to lure you into more gambling,’’ he says. Indeed, the American Gaming Association (AGA), a casino lobby group, says since the inception of FanDuel and DraftKings, the money wagered legally via Nevada sports books has increased yearly. “Fantasy sports may be serving as a catalyst for sports betting growth and helping the casino industry to attract new customers,’’ says AGA president and CEO Geoff Freeman. Washington’s gambling commission staffers have examined similar issues. Commission employees have looked into recent “insider trading” allegations against a DraftKings content manager who won $350,000 on the rival FanDuel site. DraftKings issued a statement admitting employees from both companies won on other sites. Both already prohibited employees from playing their own sites, but since have extended that ban to all domains. Such revelations aren’t helping efforts here in Washington to legalize fantasy sports. Senate Bill 5284, introduced last January by Sen. Pam Roach (R-Auburn) and Companion House Bill 1301 by Rep. Eric Pettigrew (D-Seattle), are on hold. Roach has dramatically narrowed her bill’s scope. She now wants it to only legalize small-time pool play between friends, not serve big-money daily fantasy interests. “When I really realized the scope of this, I decided I was not interested in anything but carving out a niche for people at the water cooler,’’ she says. Sen. Joe Fain (R-Auburn), the bill’s co-sponsor, said he would welcome future hearings on a modified bill. The gambling commission said it lacks resources to prosecute individuals using out of state credit cards and IP addresses to illegally play fantasy sports. But it will aggressively pursue illicit gambling companies with sting operations, armed special agents, search warrants and a reputed low tolerance for creativity. Back in 2007, Seattle lawyer Nicholas G. Jenkins formed Betcha.com, purporting to be an eBay-like third-party platform for wagering. Betcha.com allowed clients to deposit money in online accounts and bet person-to-person on sports and other propositions. Jenkins claimed he’d meticulously researched state law and Betcha.com was legal because it was uninvolved in the actual settlement process. Instead, an honor system required players to push a button indicating “I won” or “I lost” to settle bets. Only after the loser hit the button would Betcha.com transfer money from that account to the winner’s. Losers were free to not pay, though a ratings system would warn others they’d reneged. The gambling commission didn’t care. Special agents appeared at the company’s Seattle offices with cease-and-desist warnings, ordered Jenkins to refund commissions, threatened arrest and seized computers. Jenkins closed the site, but fought for years to reopen. The Washington State Supreme Court ruled against him in 2010, and Betcha.com remains shuttered. While Jenkins still lives here, onetime Chehalis resident Ehli doubts he’ll ever leave Central America. Ehli says his EZPay company serviced businesses nationwide — including an insurance provider to the Sportsbetting.com website. But Ehli insists he didn’t know every business link clients had. Jenkins and Ehli’s stories serve as a warning to fantasy sports companies.